A group of highly motivated students of the Berlin School Of Economics And Law posting about their personal interests. …I recently met. He owns a really beautiful little bookshop with a very warm and intimate atmosphere. Everything was fine till Dussmann settled right next to his place. Unbelievable. But, my friend could handle it. However, he truly had enough when Hugendubel came along as well just one month after that. 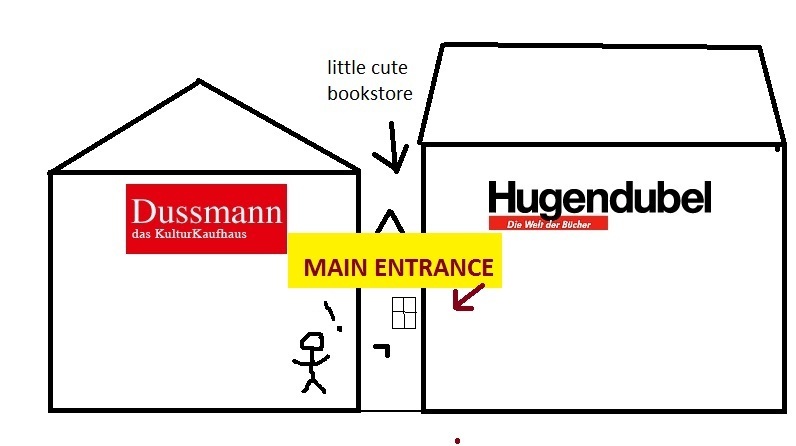 And now imagine Dussmann putting these sales posters into the window: “30% off” and then Hugendubel needed to beat that of course with a poster that said “alles raus plus free gift” so what would you do if you were that guy? And this is a concept of guerilla marketing: a striking idea is more worth than a big marketing budget. So of course, you need to put a little more time and energy and of course a lot of imagination into what you want to promote. It has to be unexpected, unconventional, interactive, unusual, creative I could go on like this forever… but the most significant thing about guerilla marketing is that it is an advertising strategy that is based on low cost. But what about the weapons a Guerilla Marketer uses? Simple. Amongst others, he predominantly uses all his contacts. Either personal or professional, doesn’t matter. He’s looking for publicity so I guess everything would be fine. It’s very important to build up a solid ground and a close relationship to your customers so they have enough trust in you in order to support you. They often say: it’s better to retain the existing customers rather than acquiring new ones. Done poorly, Guerrilla Marketing can make your company look like a nightmare. Done correctly, it is one of the single most powerful marketing tools. There are so many different kinds of guerilla marketings: there are flashmobs, street giveaways, stickers, graffiti and much more. Look at here – don’t these creative and unique pictures speak to you, they make you laugh, don’t they? they generate buzz, and if you see sth that extraordinary you’ll start talking about it – and that is the goal!! You’ll want to target consumers and you’ll want to convey or promote a product or an idea so that it turns viral! The goal of a Guerilla Marketer is to get maximum results from minimal resources! Have you seen any surprising guerrilla marketing campaigns that have shocked or excited you? Tell me! ← Latin America on its way to Socialism? good job! First of all: thanks for working that well together with me- we’re a good team. I really like the beginning of your post as it is a great story you’re starting with. Also: great job on the slide show at the end! This is a great way of visualizing what you’re talking about. The video also matches really well. However, I kind of miss a brief explanation of what guerilla marketing really is. Can you maybe add that? I was also wondering what negative effects guerilla marketing has. you’re doing a good job and i’m glad to learn from you! keep it up! great post, great story, great topic..
as i really like the approach of guerilla marketing in general, because i really like the idea of that clever approach – to beat the strong and mighty because you use your brain, this post is simply inspiring. i truly admire creativity itself, so guerilla marketing seems to be the ideal topic for me! I really enjoyed reading your post, the story at the beginning works just great – it makes your readers interested in your post. However, as I went on reading it, I became a bit dissapointed that I didn’t find what happened after the guy put that huge banner above his door. I am sure that would make an excellent point at the end of story. I am glad you provide your post with a lot of examples of Guerilla Marketing – after seeing these photos, I think everyone can really understand what this marketing concept is about without talking about it too much. wow you really have a point there daniel!!! right, what happened to the guy? well….you might not think that, but i kind of invented this story ;P…so hmm let me think – of course my friend got really successful and nobody wanted to go to hugendubel and dussmann anymore….so both of the big book chains fought to hire him as the director of marketing…end of the story: some people were killed, a love affair was uncovered, a mysterious, future forecasting book was found and my friend decided to go to new york in order to adopt america’s biggest bookstore chain barnes & noble, so he could leave this messy life behind! …and they lived happily ever after! I really like the introduction of your blog, the story you are telling. It makes your blog being more emotional. Of course also the pictures and video you are using perfectly fit your topic and help to better understand what Guerilla Marketing is. As we are business students, marketing is an important topic for us, and therefore thank you a lot for posting about guerilla marketing! What in my opinion is really useful are the “secrets of Guerilla Marketing” you mentioned at the end. They are short facts that summarize the topic in the end. caya, i love this topic! thanks you so much, the examples you showed really inspired me and i am for sure going to see if i can find more about guerrilla marketing online. we really appreciate you posting about Guerilla marketing because it is an interesting an important topic for business students. The story in the beginning caught our attention and it made us worried about the future problems of small companies in general as big companies are becoming increasingly successful. After reading the story we were both really interested in what will happen to the guy next, but as we went on reading it, we became a bit disappointed that we didn’t find out what finally happened to him and his bookstore. We are sure that it would be a great end for your post, and in addition it would give your blog a structure and a story line. As we have already started to talk about the structure of a post, we recommend you using subheadings that divide the different paragraphs of your blog in order to make it more reader friendly and clear. We are sure that headlines would make the orientation in your post easier. For the topic “Guerilla marketing” pictures are extremely important to show the reader what guerilla marketing is about. Your choice of pictures is great. Moreover the video you included is very nice and funny and another great example of Guerilla marketing. However we have noticed that many pictures are already included in the slideshow, so that it is not necessary to insert them into the post. The definition and the quote make your blog more professional, but we think that you can improve the professionalism of your blog by engaging professional’s opinions on your topic. The conclusion of your post is done in an informative and special way. Because instead of writing a conclusion sentence or paragraph you summarized the most important topics in briefly giving a few tips how to do successful guerilla marketing. thank you so, so much for your detailed comment! and also a big thank you for giving me advice and additional information!